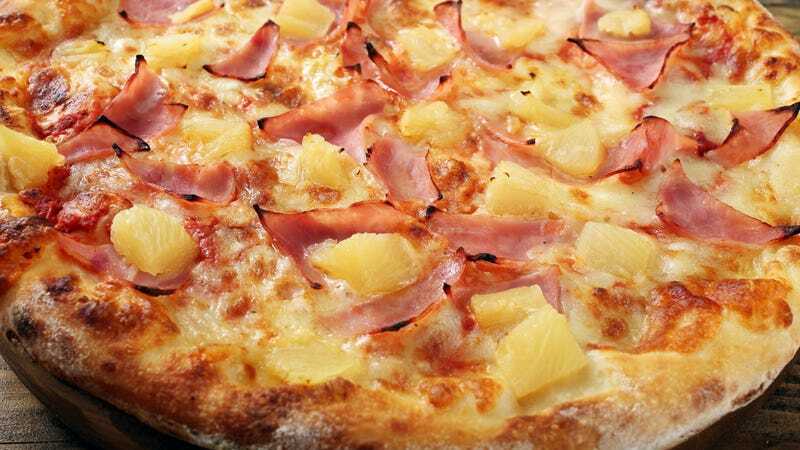 A YouGov survey has found that 24 percent of Americans believe that pineapple is one of the worst toppings you can put on a pizza. A survey of me, sitting here in front of my computer in comfy pants, has found that 100 percent of those people are wrong, because pineapple on pizza is amazing. We will return to this, believe me, but first, some more about this survey: YouGov surveyed 1,212 American adults on January 22 and 23, 2019; “The figures have been weighted and are representative of all US adults (aged 18+).” They were asked to select up to three most-favorite toppings and up to three least-favorite toppings. The results are unsurprising: We love meat and hate produce. It’s a broad generalization, but the four most popular toppings are pepperoni (the champ by a mile, selected by 53 percent of respondents), sausage (34 percent), mushroom (31 percent), and bacon (20 percent). Those most frequently named as a least-favorite option were anchovies (49 percent), eggplant (30 percent), and pineapple and artichokes (each sitting at 24 percent). You know what, screw this. I don’t have to justify this to all of you. You want to miss out on the glory and splendor, fine. More for me. Instead, allow me to use this space to say Happy Early Valentine’s Day to my partner, who after years of bemoaning my love of pineapple pizza, has started ordering what he calls “Love Pizza,” which is just a gross, super cute way of saying he orders half pineapple, half pepperoni. So romantic. So dumb. So delicious.